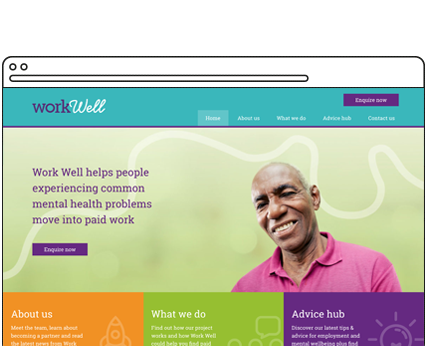 Work Well is delivered by the Career Management Service at South London and Maudsley NHS Trust. Their career coaches support hundreds of unemployed people who experience depression and anxiety. Work Well believe that having a job can drastically improve a person's quality of life and wellbeing, and that everyone is entitled to work. They also hope to reduce the stigma around talking about mental health, and make local services more accessible. We were tasked with developing a striking brand, that reflected a strong and positive message. Work Well's audience are typically difficult to reach, so the brand needed to cut through this. Most importantly, the brand needed to not feel clinical. A lot of NHS or mental health projects have a tendency to feel administrative, so a key goal for the identity was to feel personal and welcoming. Meanwhile, the website needed to deliver information in an extremely accessible and clear way. Due to the varied demographic that South London and Maudsley NHS Trust work with, the website also needed to work as smoothly on modern devices as it does on old PCs. We always start with an in-depth research phase. This allows us to make design decisions based on evidence, rather than assumptions. And we ask questions; lots of them! How would the brand be used? What makes Work Well unique? What does it need to achieve? How do we need to stand out from them? As we researched we gathered a lot of inspiration and sorted it into potential routes. From the research, we developed a strategy. We presented that and collaboratively decided on a visual route to follow, iterating until we finalised the identity. Throughout the process, Work Well involved their advisory group of service users. They provided valuable authentic feedback. Which in turn allowed us to make confident and informed design decisions. Work Well wanted something colourful and bold, but a style that would complement their parent organisation branding. It needed to be friendly, welcoming, but not feel too childish or patronising. The logo we developed contrasts the serious nature of ‘Work’ with the more flowing and friendly nature of ‘Well’. The two overlap and are inherently connected; reflective of the fact that employment can have a direct influence on a person’s mental wellbeing. Because of the sensitive nature of the topic of mental health, Work Well only had a few images of service users we could use. To solve this we customised stock photography with their new extended brand. We created a bespoke illustration of South London and a series of visual icons that can be used when photos are not available. In the background, a gently curving line reflects the shape of the River Thames - a subtle nod to the project’s South London location. Using sitemaps and wireframes, we refined the layout of the website until the structure felt complete. We then developed the brand further by applying it to the website. The purpose of the website is two-fold. It's designed to increase registrations from potential service users who need support finding employment. Built around calls to action, it is designed to funnel people towards registering. Secondly, it is intended to provide a source of guidance and support for unemployed people. We built the Advice Hub section, to tie together event listings and blog articles. This provides a one-stop-shop for helpful practical job-hunting support. The website also integrates with a mailing list, and displays Stories from real service users around the website.